The installation of artificial sports pitches has become very popular in a variety of organisations across the UK including schools, sports clubs and leisure centres. The technological advancements of synthetic grass surfacing mean that there are now more options than ever and you can ensure that your sports surface will be high quality, durable and long lasting. You can get more information on the different products and services we offer by speaking to our team today. Just use the contact box on this page to get in touch with us and tell us what you’d like to find out more about. Sand filled/sand dressed – This second generation (2G) surface is ideal for multi use games areas and suits sports such as hockey, tennis and football. The sand infill helps to give the synthetic turf fibres good playing characteristics. 3G Rubber Infill – This is perfect for playing professional standard football and rugby, the rubber infill particles help to keep the artificial grass fibres upright and ensure that the surface plays well and provides support for players’ joints. Multisport™ Needlepunch Synthetic Turf – A very durable surface which is ideal for putting greens and can be a softer alternative than polymeric rubber for athletics track runways. All of these surfaces are designed to be porous so water can drain through, meaning that your sports facility can be used all year round and in all weather conditions which is a great feature especially for schools and colleges. You want to make the most of your sports facility, so it’s important that you have all the necessary equipment and extras for each sport. These could include nets for tennis, line markings, rebound fencing and sports floodlighting. It is also vital that you carry out sport surface maintenance for artificial sports pitches to ensure that they are kept in top condition and last a long time, this maintenance could be proactive or reactive. Proactive maintenance is the regular maintenance which should be carried out to maintain the good conditions of the pitch, this could include grooming, drag brushing, decompacting rubber infill and applying moss and algae treatments to prevent contamination. Reactive maintenance takes place to repair damage to artificial sports pitches which may have occurred as a result of overuse, vandalism or general weathering of the surface. This type of maintenance could include seam and joint repairs, rubber infill top up or even total resurfacing if the pitch is in very bad condition. At Soft Surfaces Ltd, we have a wealth of experience in the sports and play surfacing industry and our friendly staff will be able to help you with all aspects of your enquiry from quote to project completion. 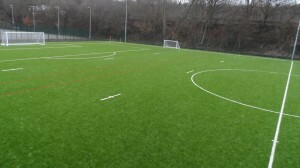 If you require any further information about the construction of artificial sports pitches, please visit our website at https://www.sportsandsafetysurfaces.co.uk/ where you can find more details about the different types of surfacing we have to offer, as well as examples of our previous work. What do you think is the best surface for artificial sports pitches? Let us know your thoughts in the comments and don’t forget to share this post if you thought it was helpful!